The Bureau of Alcohol, Tobacco, Firearms and Explosives (BATFE) is responsible for investigating instances where firearms are lost or stolen from a Federal Firearms Licensee (FFL). Part of ATF’s core mission is to protect the public from violent crime involving the use of firearms. Stolen firearms are used by violent offenders in the commission of crimes, and pose a substantial threat to the public and law enforcement. FFLs must report each lost or stolen firearm within 48 hours of discovery of the loss or theft by completing and forwarding a Federal Firearms Licensee Theft/Loss Report to ATF. In addition, the FFL must also report the firearm loss or theft to the appropriate local law enforcement agency. There was a total of 14,800 lost or stolen firearms reported nationwide last year from FFLs. Of those firearms, 8,637 were reported as lost. Firearms are considered lost when an FFL takes a firearm into its inventory and later cannot account for the disposition of the firearm from its inventory during an inventory reconciliation. There were 6,163 firearms reported stolen in 2015 by FFLs. Stolen firearms are broken down into three reporting categories: larceny, burglary and robbery. Larceny 1,120 – The unlawful taking or carrying away property from the possessor or of another. Burglary 4,721 – The unlawful entry of a structure to commit a felony or theft. Robbery 322 – Taking anything of value from the care, custody, or control of a person or persons by force or threat of force or violence. Additionally, the report includes a statistical state-by-state breakdown. Arkansas had the highest total of stolen and lost forearms with 2,951, followed by Texas with 1,024 and Florida with 700. This is the first year ATF has reported the total number of firearms lost or stolen from the 10 FFLs with the highest numbers of lost or stolen firearms, and the 100* FFLs with the highest numbers of lost or stolen firearms. The 10 FFLs with the most reported lost or stolen firearms made up 4,066 of the total firearms reported. 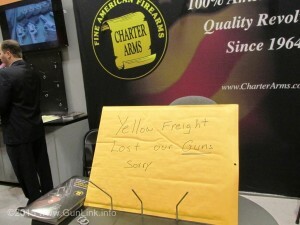 The 100* FFLs with the most reported lost or stolen firearms were responsible for 7,473 reported. This data is limited to Type 01 (Dealer in firearms other than destructive devices) and Type 02 (Pawnbroker in firearms other than destructive devices) FFLs. In an instance where an FFL discovers that firearms are lost or stolen, ATF Industry Operations Investigators (IOI) will assist the FFL in determining exactly which firearms are missing from the FFL inventory. There were more than 138,000 FFLs in the United States in fiscal year 2015. Each year, ATF releases an FFL Theft and Loss Report showing the number of firearms lost and stolen from FFLs during that calendar year. The report also shows statistics for the types of firearms, whether or not the firearms were lost, and how the firearms were stolen from FFLs. It should be noted that some states have more FFLs than other states. Higher numbers of thefts or losses from FFLs in a particular state do not necessarily indicate higher rates of firearms being lost or stolen from FFLs per capita. To view the FFL theft report click here. *There were nine FFLs tied in the final ranking of the 100 Type 01 and Type 02 FFLs resulting in 101 FFLs in total.